Seattle DJC.com local business news and data - Architecture &AMP; Engineering - Developers must ponder this: Save or scrape? There is inherent value in structures that maintain character, reduce environmental impacts or simply lower overall building costs. Residents of in-city neighborhoods know well the trend of a red-hot real estate market: Perfectly good houses are being torn down, replaced by new homes that better suit the needs of new owners. Often, that means maxing out the site and disrupting the scale and character of their neighborhoods. The commercial sector is no different. High demand for buildings of all kinds puts tremendous pressure on urban centers, where vacant ground is rarely available. Developers increasingly look to sites with underutilized buildings and grapple with the decision to demolish the building or renovate and possibly expand and repurpose. • How strong are the bones? If structural and/or MEP systems need significant modification, you’ll need enough value in other areas to offset these costs. • What are the property’s other assets? Mature trees or other natural features, a great location or site flexibility can be just as important as building qualities. • In what ways does the current building contribute to the neighborhood character, scale, fabric? A storied past, a handsome facade or strong connection to the neighborhood are qualities not easily replicated that grow more valuable over time. • What are the environmental costs/benefits of demolishing and rebuilding? It’s often said that the greenest building is the one that’s already built, because it embodies energy that doesn’t have to be expended to produce a new one. Also, demolishing and disposing of a building is increasingly expensive. • What does your schedule allow? Repurposing is often faster. 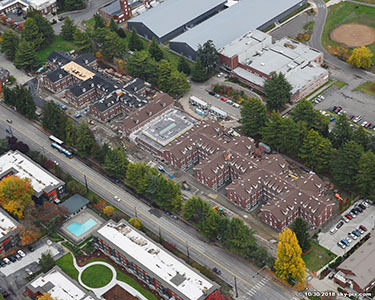 Mercy Magnuson Place will have 148 affordable apartments, an early learning center and health clinic when a renovation is finished in May 2019. Renovating an existing structure avoided multiple issues associated with developing raw land, significantly reducing costs for this exotic auto dealership. 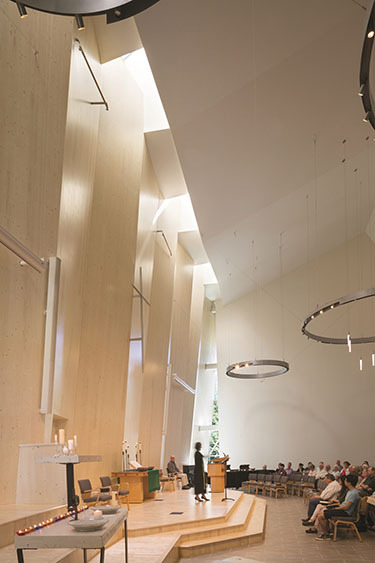 Transforming a bland 1970s low-rise office building into an inspiring new home for Bellevue First Congregational Church cost roughly $160 per square foot.